1 drawing on paper : pencil overdrawn in ink ; 2.5 x 3.75 in. 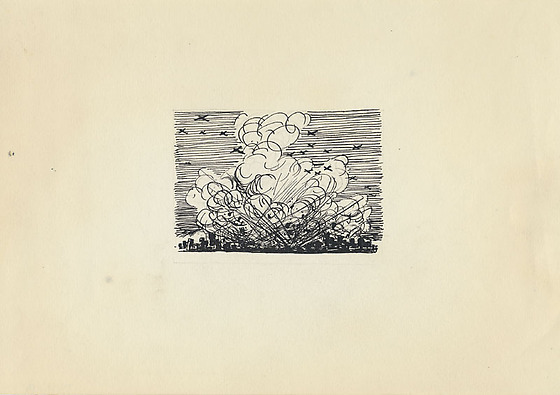 Ink drawing of the Japanese military's attack on Pearl Harbor, Hawaii during World War II. Central image is large billowing clouds of smoke rising above low, dark rectangular shapes of ships and buildings ; diagonal lines express explosions. Silhouettes of fighter planes in the sky fly toward center from right and away to upper left in a sky defined by straight horizontal lines. Unsigned.